Ulster made it three wins from five Pro12 games this season with a bonus point triumph over Cardiff Blues. Rhys Patchell kicked three penalties for the Blues, but Ulster led 12-9 at half-time thanks to tries by Andrew Trimble and Paul Marshall. Ulster stretched their advantage when Nick Williams finished a controlled drive over the line by the home pack. Centre Stuart McCloskey's try secured the bonus point before Josh Navidi's try gave the Blues forlorn hope. With eight minutes to go, fly-half Patchell landed his fourth penalty to bring the visitors to within seven points, but they failed to close the gap further. The result means the Blues have lost to all of the Irish teams in their last four Pro12 fixtures, with the opening day Zebre fixture remaining their only victory of the campaign. 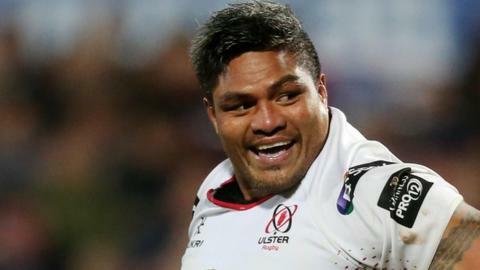 After a disappointing display away to Edinburgh a week earlier, this was a third successive home win with a bonus point for Ulster and it took their unbeaten league record at their Belfast base to 14 games. Danny Wilson's visitors had seemed set for a 9-5 half-time advantage, only for Paul Marshall to register one of his trademark close-range tries in first-half stoppage time. In the 18th minute international winger Trimble got over in the right-hand corner for Ulster's first try. It was the 31-year-old's 43rd try in the league competition, just one behind the Ulster record held by fellow wing Tommy Bowe. Just before the break, with visiting number eight Josh Turnbull in the sin bin for accidentally kicking Marshall in the face, the home scrum-half nipped over to get Ulster's second try, which Ian Humphreys converted. The tries early in the second half by man of the match Williams and McCloskey seemed to have sent Ulster home and dry. But the Blues were never out of it, and had renewed hope when captain Navidi got their 57th-minute try soon after prop Wiehahn Herbst had been yellow-carded for slowing down play. Late in the game, Cardiff's Aled Summerhill became the third player sin-binned after his lifting challenge on Craig Gilroy was deemed to be dangerous. Ulster: Ludik, Trimble, Arnold, McCloskey, Gilroy, Humphreys, P. Marshall, Black, Herring, Herbst, Stevenson, van der Merwe, Wilson, Reidy, Williams. Replacements: Cave for Arnold (54), Jackson for Humphreys (51), Warwick for Black (54), Browne for Stevenson (54), Lutton for Wilson (55). Not used: Andrew, W. Faloon, Shanahan. Cardiff Blues: Fish, Summerhill, Isaacs, Thomas, R. Smith, Patchell, Knoyle, Hobbs, Rees, Mitchell, Reed, Down, Dolan, Turnbull, Navidi. Replacements: T. Davies for Hobbs (76), Filise for Mitchell (52), Cook for Dolan (55). Not used: E. Lewis, Dicomidis, Jones, J. Evans, G. Smith. Sin bin: Turnbull (40), Summerhill (74).